The mystery begins when Mary Morstan (in Chapter 2) tells Holmes and Watson about the disappearance of her father, Captain Morstan, and the arrival of a pearl each year for six years. The Sign of Four (1890) by Sir Arthur Conan Doyle took me back to my childhood when I often read of the adventures of Sherlock Holmes and Dr Watson, and nothing much has changed with my appreciation and admiration towards this writer and these memorable characters. 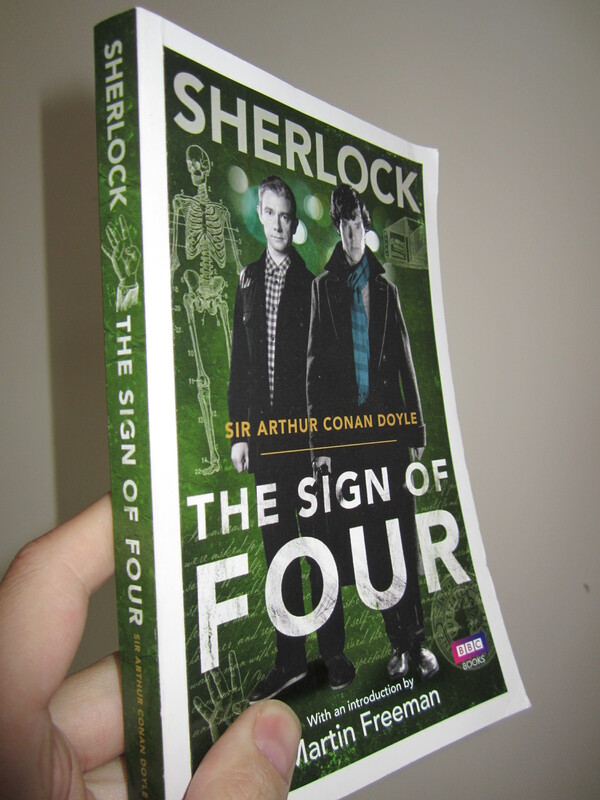 The Sign of Four (sometimes referred to as The Sign of the Four) was the second book in the Sherlock Holmes series. Set in 1888, Sherlock Holmes and his trusted friend, Dr Watson, are set on a mystery concerning the ‘Great Agra Treasure’. The story is a total of 167 pages and makes for a great read on a rainy day. The book begins with Sherlock Holmes shooting a special ”seven-per-cent solution” of cocaine into his arm. ”Sherlock Holmes took his bottle from the corner of the mantelpiece, and his hypodermic syringe from its neat morocco case. With his long, white, nervous fingers he adjusted the delicate needle and rolled back his left shirtcuff.” (p 1). When I was around ten or eleven, I first discovered Sherlock Holmes and ever since I have enjoyed this flawed hero so unlike any other hero in literature. Here is a man able to solve the most complicated of mysteries and yet he is haunted by his own genius, a demon that does not strike the common man. And in that, too, there lies a mystery. At the end of the first chapter is some of the dry cynicism I so love in Holmes: ”Crime is commonplace, existence is commonplace, and no qualities save those which are commonplace have any function upon earth” (p 12). The mystery begins when Mary Morstan (in Chapter 2) tells Holmes and Watson about the disappearance of her father, Captain Morstan, and the arrival of a pearl each year for six years. On July 7th Miss Morstan received a letter asking her to bring two friends for a meeting in order to explain about her father and the pearls. Detective Holmes and Dr Watson join her that night and the chase begins to hunt down the thieves of the Agra treasure. Along the way, good fortune would have it that Miss Morstan and Dr Watson fall in love and by book’s end are engaged to be married. As for her lost fortune, well, you have to read the book to find out. No spoilers here. But I will share what I love about Holmes. His intelligence is one of his characteristics I have admired all these years. ”’How, then?’ [Dr Watson] persisted. ‘You will not apply my precept,’ [Sherlock Holmes] said, shaking his head. ‘How often have I said to you that when you have eliminated the impossible, whatever remains, however improbable, must be the truth?’ (p 55). This is one of Holmes’s favorite sayings, and is very probable that Holmes says this in almost every story to Watson; but this is, with very little question, one of Holmes’s most famous quotes, and used in the recent films with Robert Downie Jr. as Sherlock Holmes and also used by Spock in Star Trek. ‘He whipped out his lens and a tape measure and hurried about the room on his knees, measuring, comparing, examining, with his long thin nose only a few inches from the planks and his beady eyes gleaming and deep-set like those of a bird. So swift, silent, and furtive were his movements, like those of a trained blood-hound picking out a scent, that I could not but think what a terrible criminal he would have made had he turned his energy and sagacity against the law instead of exerting them in its defence. As he hunted about, he kept muttering to himself, and finally he broke out into a loud crow of delight’ (p 57). One of the aspects of Doyle’s writing that I further admired growing up is, sadly and apparently, not as accepted in today’s methods of writing. Doyle often has Sherlock interject key bits of wisdom or philosophy as Sherlock and Watson sit around waiting for some action to take place. ‘That was like following the brook to the parent lake. He makes one curious but profound remark. It is that the chief proof of man’s real greatness lies in his perception of his own smallness. It argues, you see, a power of comparison and of appreciation which is in itself a proof of nobility. There is much food for thought in Richter. You have not a pistol, have you?”’ (p 79). Doyle, as might be a surprise to some, can be a romantic at times as well. ”’Thank God!’ I [Watson] ejaculated from my heart. [Mary] looked at me with a quick, questioning smile. ‘Why do you say that?’ she asked. ‘Because you are within my reach again,’ I said, taking her hand. She did not withdraw it. ‘Because I love you, Mary, as truly as ever a man loved a woman…”’ (p 131). ”’But love is an emotional thing,’ Holmes said, ‘and whatever is emotional is opposed to that true cold reason which I place above all things. I should never marry myself, lest I bias my judgment”'(p 166). Watson defends himself and his future with Mary, and then asks about Holmes’s future if it is to be empty of love. ”For me,’ said Sherlock Holmes, ‘there still remains the cocaine-bottle.’ And he stretched his long white hand up for it” (p 167). Returning to Sherlock Holmes and Dr Watson after many years of my absence from their stories, I find each is still as clever and witty and amusing and intriguing as when I first read them decades ago. The Sign of Four is not one of the better novels by Doyle (see: A Study in Scarlet [the first novel published in 1887] or, The Hound of the Baskervilles – the 3rd novel published in 1902) but The Sign of Four is still a fun read. What’s up, after reading this remarkable paragraph i am as well glad to share my experience here with colleagues. I am glad you got some enjoyment out of the information on this site… keep coming back for more. I appreciate your comment. Glad you enjoyed the post. Glad you thought so. Have a special day. Usually it is caused by the fire communicated in the article I read. And on this post The Sign of Four (1890) by Sir Arthur Conan Doyle | C.G. -P I do have a couple of questions for you if it’s allright. to keep up with you. Would you list all of all your communal pages like your Facebook page, twitter feed, or linkedin profile? appreciate your way of blogging. I saved it to my bookmark webpage list and will be checking back in the near future. I would never understand. It kind of feels too complicated and extremely huge for me. I’m taking a look forward in your subsequent put up, I’ll attempt to get the hang of it! Happy to provide you this service. I strongly feel this kind of information should be free and open to the service. Keep reading, there will be lots more to come. What’s up to all, because I am really keen of reading this webpage’s post to be updated on a regular basis. of your story. It’s surprising you aren’t more popular because you surely possess the gift. This will help everyone soooo much! unique thoughts on this subject. Really.. thanks for starting this up. I’m happy you think so. Keep smiling and reading. Onward! I’m glad you enjoyed it. Trust me, there will be lots more. Keep reading. is uncommon to see a great blog like this one today..
soon. Anyways, if you have any suggestions or techniques for new blog owners please share. After looking at a handful of the blog posts on your blog, I seriously like your way of writing a blog. I value the knowledge on your site. Thank you so much!.